(Office of Her Majesty, Press Department – Oslo) Her Majesty Queen Rania Al Abdullah met today with His Majesty King Harald V and Her Majesty Queen Sonja of Norway in the Norwegian capital Oslo. The meeting was also attended by Board members of the United Nations Foundation (UNF). 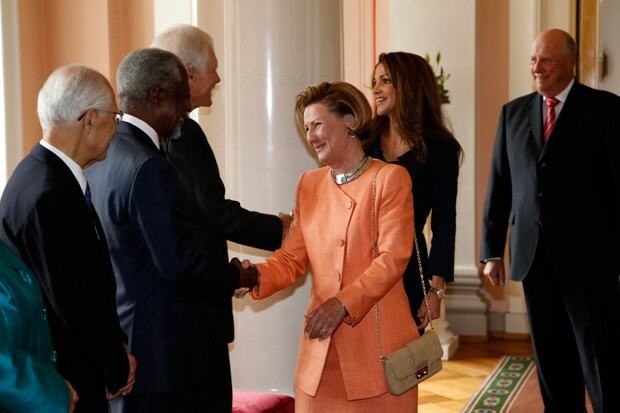 Queen Rania is in Norway attending the UNF Board Meeting, in her capacity as a member of the Board since 2006. The UNF Board members have previously met in Jordan in 2007. During the trip the members toured the Kingdom and witnessed firsthand several social development projects including several educational initiatives and schools. The trip to Jordan also witnessed the launch of the World Heritage Alliance and the Jordanian Ministry of Tourism and Antiquities partnership to preserve and protect the historical city of Petra. The World Heritage Alliance for Sustainable Tourism (WHA) is a membership-based initiative launched in 2005 by the United Nations Foundation (UNF) and Expedia, Inc.
UNF is a public charity that was founded in 1998 with entrepreneur and philanthropist Ted Turner’s historic $1 billion gift to support UN causes and activities. The Foundation works as an advocate for the UN by connecting people, ideas, and resources to power solutions to global challenges. In Addition to Her Majesty, UNF Board members include Ted Turner, Chairman, Turner Enterprises; Timothy E. Wirth, President, United Nations Foundation and Better World Fund; Kofi A. Annan, Former Secretary-General of the United Nations and 2001 Nobel Peace Prize Winner; Gro Harlem Brundtland, Former Prime Minister of Norway, Director-General Emeritus, World Health Organization; Igor S. Ivanov, Former Minister of Foreign Affairs of the Russian Federation; Professor Yuan Ming, Director, Institute of International Relations, Peking University; Hisashi Owada, President, International Court of Justice; Emma Rothschild, Harvard History Professor; Dr. Nafis Sadik ,Special Advisor to the UN Secretary-General; Ambassador Andrew Young, Chairman, Good Works International; Founder, Professor Muhammad Yunus, Grameen Bank of Bangladesh; Graça Machel - Emeritus, Chair, Foundation for Community Development; and Liang Dan- Emeritus, Director of Investment and Technology Promotion, UN Industrial Development Organization (UNIDO).